The original statue was created in 1919 and it sits atop a monument for those who bravely served during World War I. This monument was the first World War I monument in Reading and one of the first in the U.S. A few years ago, a replica was created and placed in the Reading Historical Society museum in Cincinnati, Ohio. 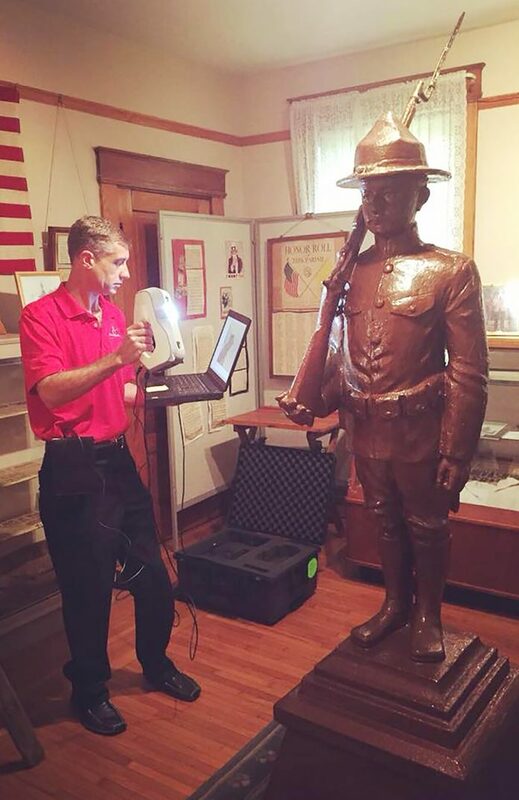 Wanting to keep this piece of history alive, the Reading Historical Society contacted Exact Metrology to scan the statue. Exact used their Artec 3D scanner for the task. The Artec 3D scanner is a portable 3D camera that captures video, each single frame of which is a 3D image. Walking around the object captures it with camera from various angles and the accompanying software combines the scanned frames in a single mesh. All Artec scanners have measuring speed up to 1.5 million points per second, while also providing high resolution (up to 0.2 mm) and high accuracy (up to 0.02 mm). Scanning of the statue took two hours and two days to process the data. The data was then transferred to the University of Cincinnati, where a number of statues were 3D printed in small form. These statues will be sold at a fundraiser.